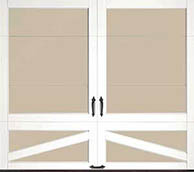 Authentic looking insulated steel and composite carriage house garage doors. 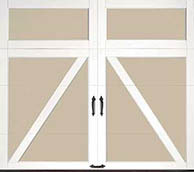 The perfect blend of beauty and practicality, these carriage house doors look like wood, but they are actually crafted of multiple layers of durable, low-maintenance steel and insulation topped with a woodgrain textured composite overlay. COACHMAN® collection garage doors feature the charming appearance of an old-fashioned swing-out carriage house door, but offer the built-in convenience of a modern overhead garage door. Throughout the design and construction, there is a recurring blend of beauty and practicality that is evident in the details, like the attractive yet durable steel and composite construction. 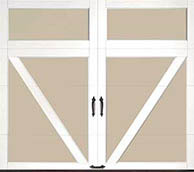 Steel carriage house doors with 4-layer construction. 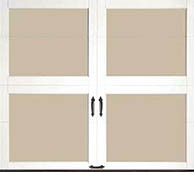 Insulation options include 2" Intellicore® polyurethane, 2" polystyrene or 1-3/8" polystyrene insulation. 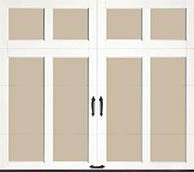 The R-values of these garage doors range from 6.5 to 18.4. The steel skins of these doors are protected by the use of a tough, layered coating system, which includes a hot-dipped galvanized layer and baked-on primer and top coat. 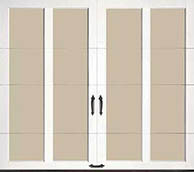 WINDCODE® reinforcement product available for high wind load applications. Four factory finish paint and overlay colors. 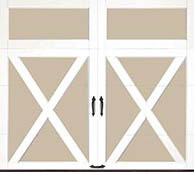 Overlay and base colors can be mixed to achieve desired look. 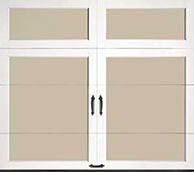 Many glass options, including clear, seeded, rain, obscure, frosted and insulated. 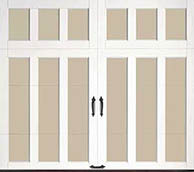 Attractive beveled edge clip-in window grilles are removable for easy cleaning. Comes complete with spade lift handles and step plates. Additional decorative hardware options available. 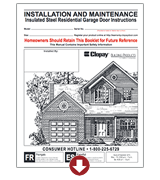 Clopay recommends the LiftMaster® Elite Series opener for these garage doors. 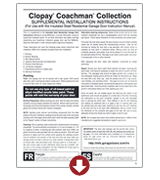 For size and color availability, click here. 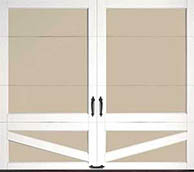 Replaceable vinyl bottom weather seal in rust free aluminum retainer helps protect against the elements. 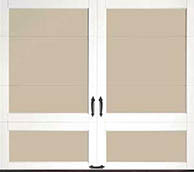 Grilles are removable for easy cleaning. Patented Safe-T-Bracket® - Prevents serious injury that could occur if the bottom bracket were removed with the garage door closed and under tension. Door sample shown in Standard White.